Thanks Becks, there's the chequered flag for this live page. What a race that was, from start to finish it was fantastic - why we all love this crazy Formula 1 game. Lewis Hamilton wins it, with Valtteri Bottas second after an engine malfunction denies Charles Leclerc his first ever race win. Hope you all enjoyed it as much as we did. Thanks as always for joining us and for your comments. Next up is China in two weeks' time. Let's hope for more of the same. Remember to tweet us using #bbcf1 to tell us what has been your favourite race of all time. You could even say this one, if you want. He got hit and then got a puncture, then he had to retire the car - so not a great day in the office for the McLaren driver. David: The best driver came 3rd. Better luck next time. Decent race with plenty of overtaking. John: Class from Lewis, first thought on the radio is for Leclerc. Is it the sand? Is it the heat? Last year Vettel won the Bahrain race from pole, but he didn't have such luck this year. And in reality he hasn't had much luck since Bahrain last year. Hamilton has three wins and two poles, to Vettel's four wins and three poles. Also, Ferrari seem to have the most luck here overall, but maybe not today. 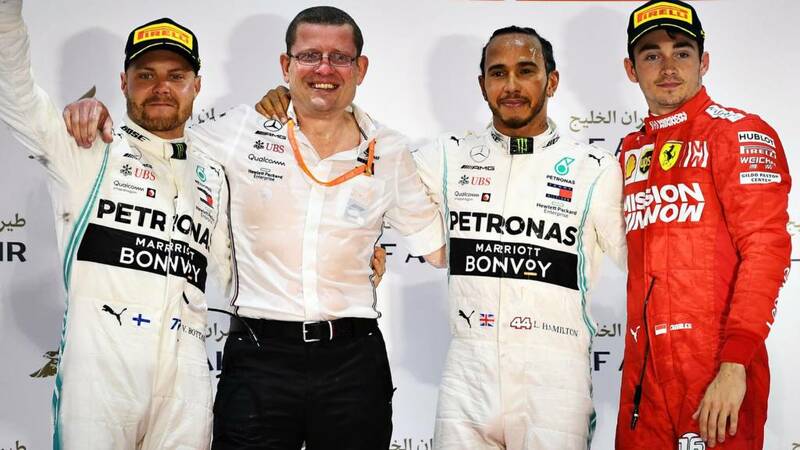 They have the most wins in Bahrain with six, while Mercedes are following behind with four. Two races in and that is one hefty lead Mercedes have got already. Next time out, the Chinese Grand Prix, is the 1,000th Formula 1 race ever. What has been your favourite F1 race ever and why? Ash Green: Lewis is great but I’m no means his biggest fan... But today in victory he was so perfectly humble and respectful of what should’ve been Charles’ first GP win, I can't fault that sportsmanship. Justice: Heartbroken for Leclerc after such a great performance. But happy for Hamilton and the Mercedes one-two. Couldn't have asked for better. Bishop: You have to salute @LewisHamilton for showing respect and acknowledging the great talent of Charles. These are all the races that Sebastian Vettel has spun in since last year's summer break when his championship hopes spun out of control. As our commentator and former Renault driver Jolyon Palmer pointed out in his column last year, every time this has happened, Vettel is on the inside loses confidence and spins to avoid contact. "This is so unusual in racing. Usually with small contact it is the driver on the outside who is in a more precarious position, but spinning on the inside has now happened three times in quick succession to Vettel. "In isolation, all are simple racing incidents. It's wheel-to-wheel racing and someone comes off worse. It's unlucky for Vettel." Also, if you type in "Vettel spins" into your favourite search engine, you'll find that this has happened a lot over the years... you'd think he would have ironed it out by now. Who else? Leclerc was outstanding and should have taken a maiden victory that marks him out as a major star. But it's clear there will be another chance after a performance as impressive as this. Red Bull's Max Verstappen who finished fourth speaking to Sky Sports says: "We did not deserve to be on the podium today. We did not have the pace and the balance of the car was not good. I am not too disappointed [with finishing fourth]." McLaren's Lando Norris finished an impressive sixth and says: "I don't know where it came from. The whole race today was more fun than Australia. I had better pace than I thought we would have. "I got knocked down to 12th because of some contact and got back to P6. I could have done him [Kimi] a couple of laps earlier. I used my own initiative." Another DNF for Renault's Daniel Ricciardo and talking about the one-stop strategy says: "It was pre-planned, during the race it was not the best thing. A two-stop would have been preferred. On his car stopping: "I am not sure what happened and if it was the same issue as Nico, just coincidence that it happened at the same time." The beard theory is still going strong. In 2019, to win a race the driver must have a beard, it seems. On and off, Lewis Hamilton has one, Valtteri Bottas grew one over the winter and stormed through to win in Melbourne... so leave that razor alone Charles. Earlier this month Charles Leclerc was the subject of this feature looking at his journey to Ferrari. Just before Charles Leclerc's father died in June 2017, his son told him a little white lie. Leclerc was in the middle of his Formula 2 season, a member of the Ferrari driver academy, and being widely tipped for a graduation to Formula 1 the following year. He knew his father, Herve, was close to the end. So Charles told Herve that he had been guaranteed an F1 drive for 2018. Only he hadn't. "It was a bit earlier than I had really signed," Leclerc recalls, "but in the end I didn't lie because I am here and now in Ferrari, which feels incredible." Euan: Everyone is talking about Leclerc and rightly so but we must spare a thought for @alex_albon. Great second race and first points finish to boot. Fraggle: Pure class from @LewisHamilton giving credit to Leclerc over the radio and in his interview. Rachel: Superb from young @LandoNorris too - making it look easy! A great sixth place for the young Brit!